When I saw this dish, I wanted to try it out because I happened to have a large piece of shark in the freezer, but I didn't have any shark liver. Some recipes don't call for liver, but I read here, that the most authentic version of Sinagol is with shark liver and the whole dish is cooked with rendered shark liver fat, or sting ray fat if one is using sting ray flesh. 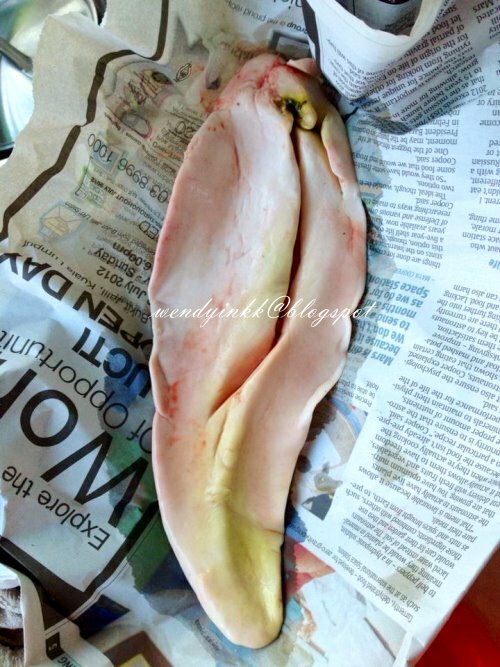 So, I decided to make a trip to the wet market, something that I don't do often.. and so I was greeted with a beautiful piece of shark liver lobe from a baby shark. I'm glad it's a baby shark because adult sharks are high in mercury. For your information, shark consumption is not banned in my country. 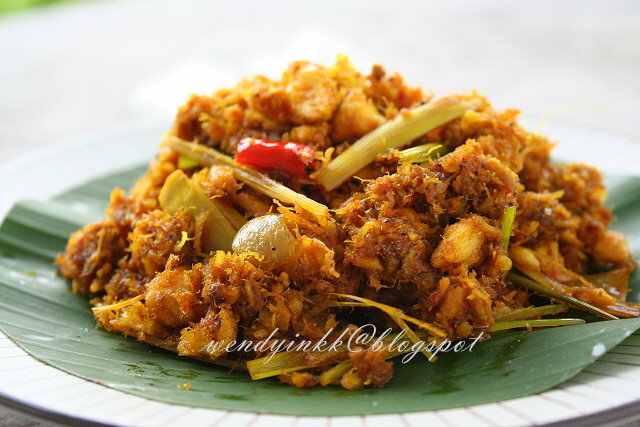 And traditionally, in Sabah, baby sharks that got trapped in the shallows during low tide are being used in this dish, they don't hunt for a large shark and cook only a part of it. Shark liver, just one lobe This piece is around 400gm. It's a fresh piece and the green is from the bile. I am not a liver person. I hate liver of any sort. The aftertaste is hard to get rid off and it stays on my tongue. When I was a kid, grandaunt tried to introduce pork liver to me a few times. And each time, I'll vomit everything out and scrape my tongue to get rid of the aftertaste. So when an authentic version of sinagol calls for shark liver, I really had to think think many times. Even after buying, I thought again, whether I should cut it.... after I cut it, I contemplated whether I should photograph it in the ingredients list.... when it's time to cook.... I had to think and think again whether I should put it in, as just do a modern version of it. Lots of hesitation and contemplation. Finally, I cooked a small piece of it, bravely put into my mouth, just to see if I could accept the taste, before I ruin the whole dish. Surprisingly, I could, in small amounts. The liverish taste was a lot milder compared to mammals' or birds'. So, I bravely decided to go with it. Just before cooking, I asked myself again, should I cook the whole dish with rendered shark liver fat, the most traditional version... or add shark liver bits half way..... as in a slightly modernized version.... I decided to go with less liver and add them in halfway. And being very worried about the liver smell, I became liberal with the turmeric. Sinagol can be cooked either dry or with gravy. I wanted to play safe and go with dry. Frankly... I am still very reserved about this dish. Once I have cooked this, and tasted it...it was nothing as scary as I imagined it. 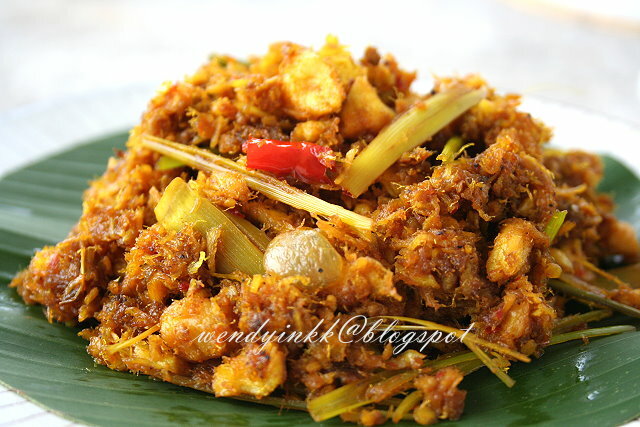 Pleasant, fragrant, spicy flossy shark, nothing gamey about it.... a wonderful dish to go with rice. I won't mind eating this again, but I don't think I would buy a lobe of liver again, using just a bit of it and wasting the rest. 2. Coarsely grind onion, garlic and chilli together. Cut lemon grass into 2 inch sections and bash them. 3. Heat a wok and put in the onion paste, saute until fragrant. 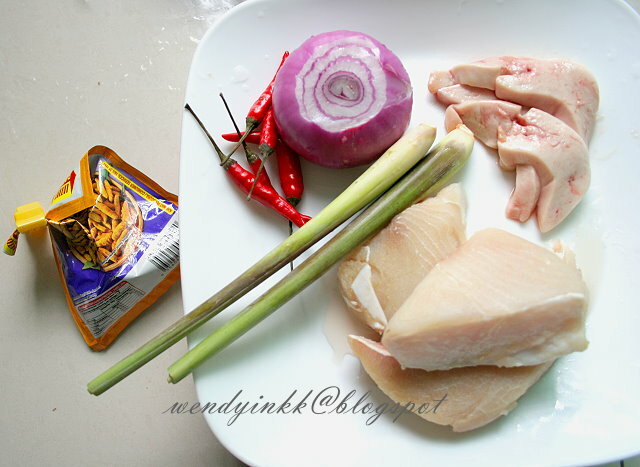 Put in lemon grass and further saute until very fragrant. 4. Add in liver slices and turmeric powder and let it cook until it starts to release oil. Put in shark meat and add salt to taste. Cook until the dryness you prefer. You may add water if you prefer some gravy. *If you don't mind eating liver, you can use more liver, and render the fat out for sauteing the onion paste, just like how we make and use lard. 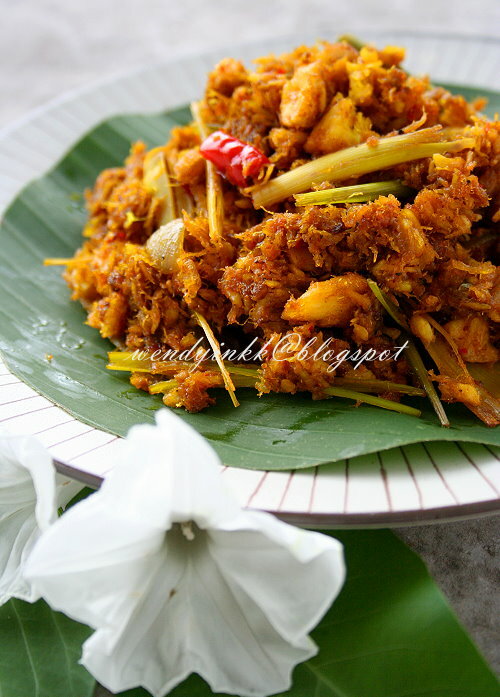 ** You can opt to leave out liver as some recipes on the internet do not have them too. Oh yeah, liver eaters are liver lovers. It's like okra and brinjal, either you love them or hate them.